Stunning West Village house within a house. 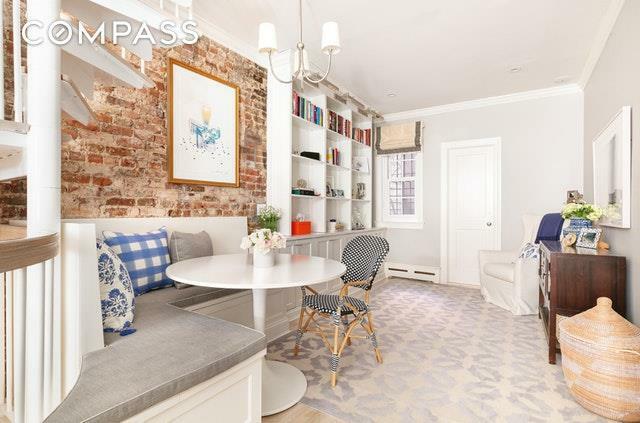 53 Horatio Street is a fully renovated and charming three bedroom, four bathroom co-operative enveloped in a quintessential 1848 Federal townhouse. 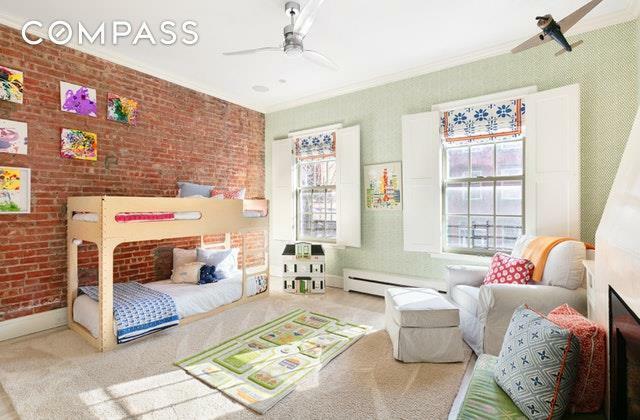 Ideally positioned on a tree lined, cobblestone West Village block, this sun-filled home offers a rare blend of prewar details including four wood burning fireplaces and exposed brick throughout juxtaposed against a modern renovation. The spacious parlor floor, bathed in sunlight from a South facing oversized window, has an open floor plan that can be configured to accommodate multiple living and sitting areas. A beautiful, original wood burning fireplace is set within an exposed brick wall. A custom built-in banquette functions as seating for casual dining or relaxing and built in shelving provide additional storage. Additionally, there is an elegantly renovated powder bath outfitted with top of the line Waterworks fixtures and tile. The second level is home to a large bedroom with 10 ceilings, a second wood burning fireplace and exposed brick wall. This room is flooded with natural light through generously sized South facing windows. 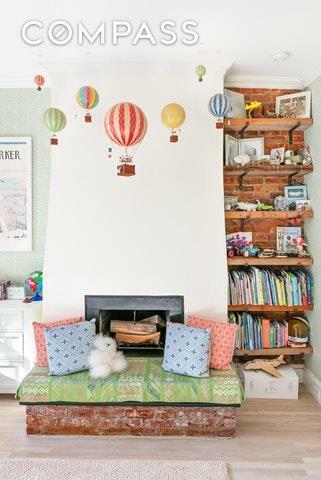 It currently functions as a childrens bedroom, clad in Farrow and Ball wallpaper, but could be easily converted to a Master bedroom or secondary living room. An ensuite full bath has been renovated with Waterworks fixtures and a bathtub. 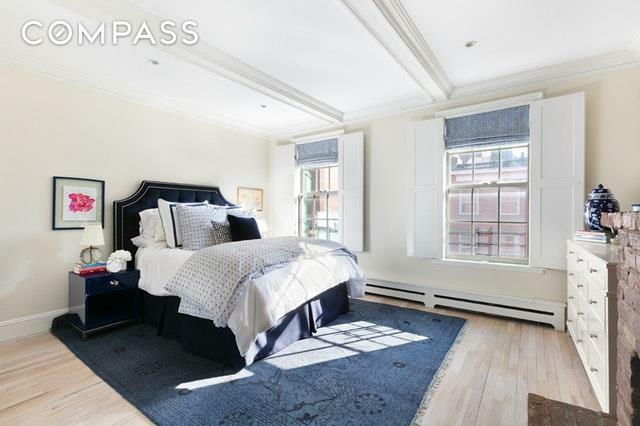 On the top floor a generous master bedroom provides great privacy and separation from the lower level living spaces. The exposure here is also South facing with a wood burning fireplace and fully built out deep storage closets. The master bathroom has been tastefully renovated with Waterworks fixtures and features a large walk in shower. True to many other historic West Village townhouses, a mint condition kitchen is located on the garden level. The kitchen was completely renovated in 2016 and outfitted with top of the line luxury appliances by Viking, Miele and Sub Zero. An adjacent room offers flexibility as a third bedroom, den or formal dining room with wood burning fireplace. A full bath on this level is equipped with fixtures and finishes by Waterworks, and a wall mounted Toto toilet. This professionally designed home has been updated with all new plumbing, electrical, lighting and sound system, and a security system.53 Horatio Street is a 5 story self-managed co-operative building comprised of 6 apartments. Amenities include a part time superintendent and video security. Pets and pied-a-terre are not permitted. Co-purchase, gifting and guarantors are permitted.